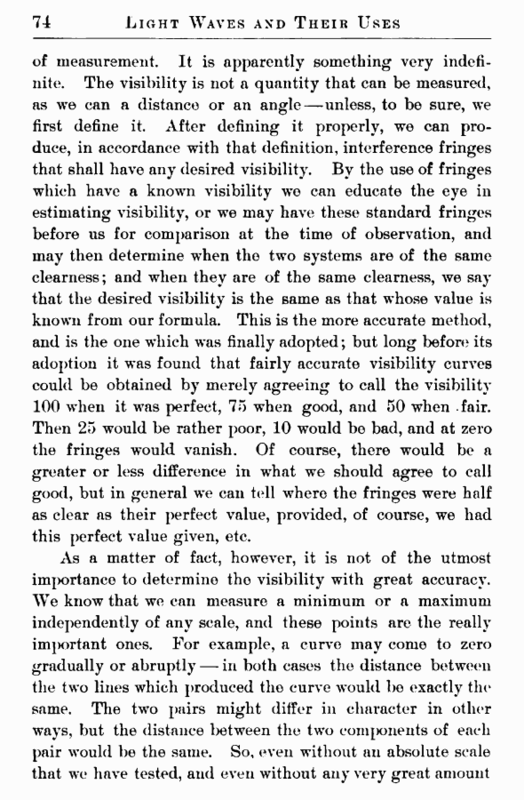 of experience in observation, we can get a very fair visibility curve, and from that a very fair conception of the nature of the spectrum of the particular source we are examining, by merely determining the points of maximum and minimum clearness. I should like to say a word concerning the source of light. When the source is under ordinary conditions, i. e[■ under atmospheric pressure, the molecules are not vibrating freely, and disturbing causes come in to make the oscillations not perfectly homogeneous. Hence the light from such a source, instead of being a definite, sharp line, is a more or less diffuse band. In order to obtain the character of the line under the extreme conditions, i. e., under as small pressure as possible, the substance must be placed in a vacuum tube. The tube is then connected to an air pump and exhausted until the pressure in it is reduced to a few thousandths of an atmosphere. When the exhaustion has become sufficient — the time depending on the particular degree of exhaustion required by the substance which we wish to examine — the tube is heated to drive off the remaining water vapor, sealed up, and is then ready for use. 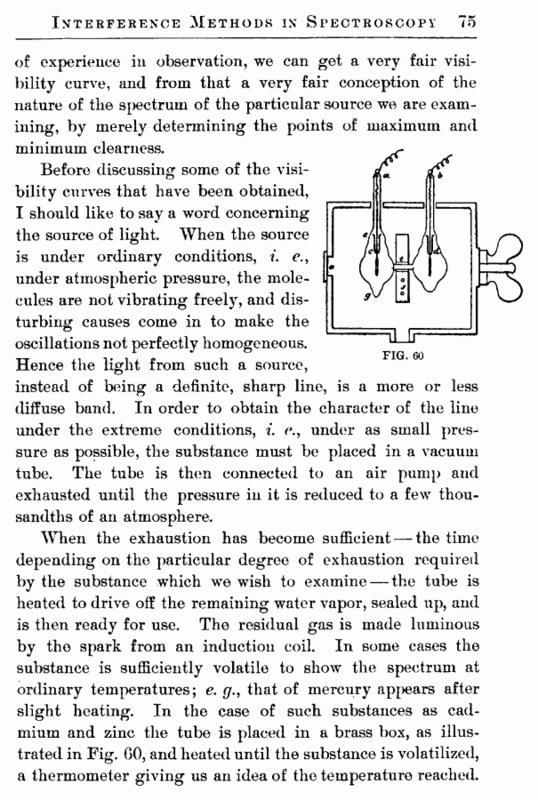 The residual gas is made luminous by the spark from an induction coil. In some cases the substance is sufficiently volatile to show the spectrum at ordinary temperatures; e. g., that of mercury appears after slight heating. In the case of such substances as cadmium and zinc the tube is placed in a brass box, as illustrated in Fig. GO, and heated until the substance is volatilized, a thermometer giving us an idea of the temperature reached.